The Rigid Q Series Marine Line of LED Lights are for the customer who demands high power lighting in the demanding marine environment. 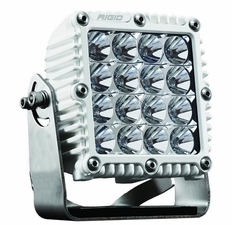 The Rigid Q2 Marine Series LED Light features the same output as 4 Rigid D2 Series LED Lights. Ideal for all marine, even salt water applications,, the Rigid Industries Q Series Light measures 6.79� x 6.75�. They have a depth of 3.42�. The light output is a blinding 12672 raw lumens with a 8.8 amp draw and 123 watts from its 16 powerful LEDs. Encased within a high impact housing with a polycarbonate lens, the Rigid Q Series LED Light also features a vibration isolator and a 304 stainless steel bracket. Also included is a plug and play harness with a switch.